It’s Spring! What To Do With Your Winter Clothes? Now that spring is here, you can take off the heavy winter jackets and boots. But what do you do with them? It’s important to be methodical in how you store your winter clothing as it can take up a lot of unnecessary space and become damaged or smelly. They are also more susceptible to insects that are present in warmer weather. If you buy new clothes regularly to keep up with the trend, then there might be no point in keeping your old jacket. Consider donating your winter clothing to charity or give them away to relatives. 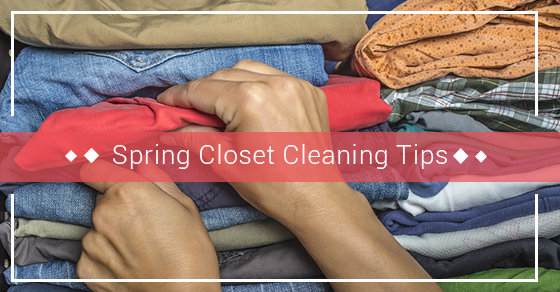 The spring is a great time to declutter and get rid of excess clothes, and as a result you will have fewer items that need storing. Although it might be a given, it is still important to remember the importance of keeping your clothes washed or dry-cleaned-even if you are not wearing them. If you have stains (or worse-food crumbs) in your clothing, that will attract bugs and insects in the summer weather. A good way to keep the bugs away is by using cedar blocks or bags of lavender. This will also give your clothes a good smell for the entire off-season. Keep your clothing away from damp places. Your clothes could be vulnerable to fading and mildew. If you have a self-storage unit, make sure the lighting and temperature is controlled. Ideally the storage place should be well ventilated, cool and dry. When packing clothes you should always make sure you have the right containers. Plastic containers are best and you should store the heaviest beneath and keep them wrapped in ph-neutral paper. It is also good to check on your clothes from time to time even in the height of summer to make sure that all is well. If there are bugs on your clothes you can take action to prevent further damage from occurring. Also, it is best to stick with plastic containers rather than natural materials. Plastic is less vulnerable to being consumed by insects. Sometimes it might be best to employ external storage. Self-storage allows you to store excess items efficiently, leaving the space in your home free for other uses. With Jiffy Storage there are a wide range of cost effective solutions for your storage challenges, all of which will protect your seasonal clothing from the elements and from bugs or pests.